arglebargle! : Say It Ain't So, Pete! This thing NEVER fails to have me in hysterics. The setup for Petey's greatest battle (some battle, he never gets off the couch!) is so unintentionally hilarious that it seems more like a in-house Marvel "Hostess Fruit Pies" ad than a "very special comic." Sadly, using Spidey as the "hook" here doesn't have the intended effect; you can't take the subject matter seriously, and what should be taken with the utmost seriousness becomes a jump-the-shark moment. Hmmm...Actually, this explains a lot. Don't think I'd be facing front when that Skip's around. 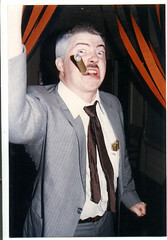 There'll be NO buggery around here, if I have anything ta say about it! I'm going to be the one guy here who doesn't find the comic unintentionally funny (except, perhaps, for Jim Mooney's artwork, which I've always disliked). I remember the comic being put together about the time I was working there, and they seemed to take it quite seriously. And if you think about it, of all the Marvel characters, wimpy Peter Parker is the one most likely to have sexual abuse in his background. There. I've said it. Now you can start throwing things at me. Jim brings up a good point, which is that the folks behind this hindenberg of a comic actually had the best of intentions. That having been said, to quote Lucy Van Pelt: "In all of mankind's history, there has never been more damage done than by people who 'thought they were doing the right thing'"
I've been thinking about why the comic is unintentiionally funny to you guys, and I think I have it: the artists, and to some extent the writer. I think a different creative team could have pulled off the same premise successfully. I knew Salicrup personally, so I'm not going to bash him. However, I have no connection with Mooney or Esposito, so they make targets as convenient as any. The two are so old-school -- and I don't mean that in a good way -- that their artwork can't help but evoke memories of hackneyed comics where something like sexual abuse would be totally ridiculous. Any number of more contemporary artists, on the other hand, don't carry that baggage. They might have been able to pulll it off. Hear Hear. It's almost IMPOSSIBLE to not laugh at those hackneyed panels with Petey talking to Skip; as Clay noted, he looks like Magneto! The whole thing looks like an issue of "Spidey Super Stories" gone horribly wrong. Marvel tackled some pretty heavy stuff (nobody laughed at Harry Osborn's overdose sequence) but I think this could have been done about a zillion times better...Of course, today it would have been drawn by Rob Liefeld and everyone would have had poofy hair, even Uncle Ben! Hey...Watch yer mouths! I'm half gay myself... only half...no buggery. I always thought that you were a lesbian in a man's body. Shortly after Pete's brave revelation, Ant-Man confessed to similar acts of buggery, Johnny Storm admitted he had always been a flamer, and Reed Richards renewed his vow to spend the rest of his life helping Ben Grimm get his rocks off. An unpublished sequel to this shocking special issue reportedly dealt with Captain America, Bucky, some Hostess Fruit pies, and an international cover-up. Meanwhile, rumors persist as to how Dr. Octopus, the Green Goblin, and the Ex-Men really got their names. 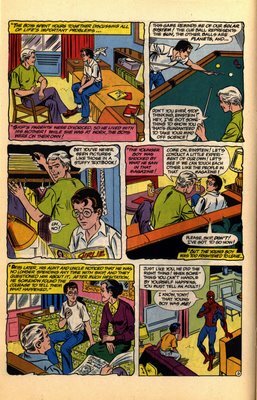 PS- If you ask me real nicely, I'll tell you how Uncle Ben really responded to Pete's tale of woe. What I wanna know is why does the Green Goblin carry a pink handbag? If you want to see more stupid comics, click here! Hi, Jim Salicrup here, the guy who wrote that story. First, let me say that I thought both Jim Mooney and Mike Esposito did a fine job illustrating the story. Most of the criticisms mentioned seemed very nit-picky and unimportant. The story was very clearly told, in a straightforward manner. 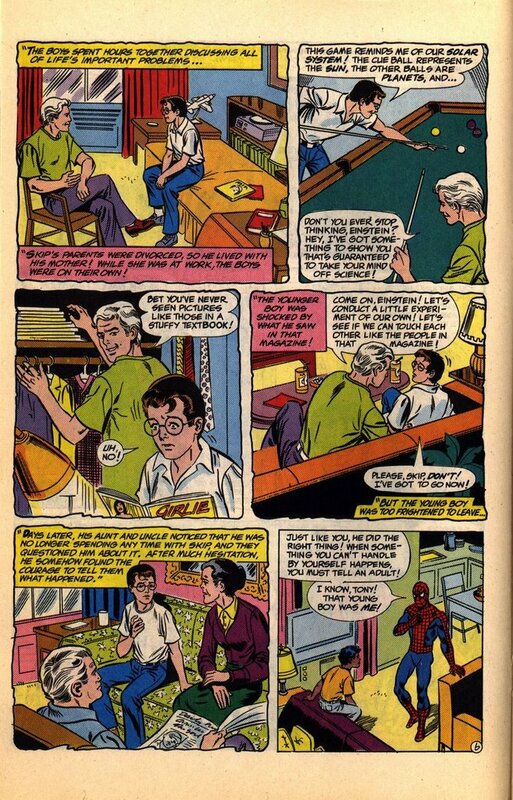 Second, unlike the original Spider-Man drug issues, or countless other comics dealing with real-life issues, this comic was produced with an organization that had very clear ideas about what it wanted and how it was to be presented. More importantly, this wasn't meant to be another entertaining issue of Spider-Man that happened to have a serious message, rather this was a comic designed specifically to convey a message to young children in a way that they could understand it. So, while it may seem unintentionally laughable, it was actually very effective with its intended audience of young children. As a direct result of this comicbook many child abusers were actually caught and successfully prosecuted. So, yes, it does appear more like an issue of Spidey Super Stories than Amazing Spider-Man -- both Esposito and I worked on SSS for many years. As for the idea that this comic should have treated the subject "with the utmost seriousness," I believe it did. The two main points the comic was addressing was that child abuse was not the victim's fault (too often children are filled with shame and guilt, convinced that they did something wrong) and that the best thing to do was to discuss the problem with a trusted adult. 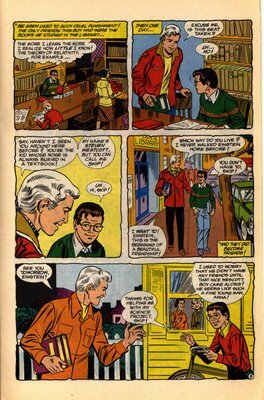 Again, this was not meant as a regular issue of Spider-Man and its older audience, but for young children. To a sexually abused child, having a heroic character confess that he too had been sexually abused is a very powerful and important message. Regarding Skip... sexual predators come in many forms. Magneto jokes aside, it made sense that Skip would seek out a lonely younger boy like Peter Parker and befriend him as part of his "seduction." I'm not exactly sure what you mean when you say that you're "blown away that Marvel decided to portray their top-tier character Spider-Man as a victim of sexual abuse." I thought it was in keeping with Stan Lee's vision of creating super-heroes with human problems. Regarding the "older (and hot) babysitter" coming onto the young boy in the story -- I'll assume you're simply being glib. Surely, you agree that any older person, no matter how hot they may be, attempting to molest a young child is not a good thing. Finally, I appreciate Jim Massara's comments on my behalf. But to be completely clear, I really don't have any problems with anyone finding this story poorly written. Everyone's entitled to their opinion, and I certainly respect that. 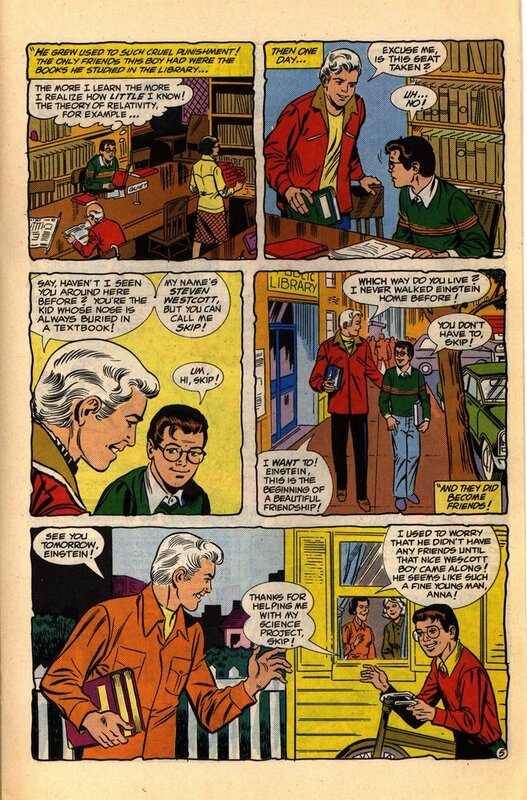 In fact, even when this comic was being created, a friend of mine joked that he could just imagine an abusive father, upon discovering his child reading this comic, forcibly taking the comic away from the child, rolling the comic up, and then smacking the child with it. I did give me pause, I admit. But overall, I believe the comic did a lot of good, and I'm still proud to have worked on it. Well Jim, I'm sorry if you were offended, but I can't say I blame ya if you were. Admittedly I've never really been a big fan of Mr. Mooney or Mr. Esposito (though I do repect their longevity and body of work) and I don't think anyone would argue the point that this isn't either's best work here. But I never said that I thought the story was "poorly written"...in fact I didn't really specifically adress the writing at all--Unless you count how fast Skip moves in on Pete. However, is it the greatest Spidey Tale ever told? Nope. Not that that's your fault either--given the established criteria and the NEA partnership it couldn't possibly be. It's a one-shot Super-hero comic that focuses on sexual abuse aimed at kids for cryin'out loud! As close to home as you needed the story to hit, the fact of the matter is you're still having to do a considerable amount of tap dancing because of the volatile nature of the material and the time period in which it was created. You're bascially adressing something very heavy in a naive way (again...because it's aimed at young kids). As a result the whole story does have a kind of stilted "After school special" (or PBS) feel to it. Though I am surprised that you're surprised that someone wouldn't be "blown away" by this kind of revelation about their lifelong icon/hero Spider-man. Virtually very person I've ever seen read through those pages has had the same "Oh, NO...I can't believe they would do this to ol' Spidey!" reaction. My title "Say it ain't so, Pete!!" was something a friend of mine actually said when he got to the seduction scene page for the first time. I'm sincerly happy that this book has done so much good for kids. You should feel good about that. Without question. This posting however, does nothing to detract from that good. Subsequentially it's probably gone a long way to raise awareness that this comic even exists! (Especially since nobody I've ever shown it to has ever even heard of it.) In contrast --and given your own body of work-- a relatively small faction of fandom poking a little fun at a "very special episode" of Spider-Man you wrote for young kids seems like it should hardly even be on your radar scope. Rest assured though, that this will be the only Spider-man story you ever worked on that will ever be goofed on in this forum. I can just about promise you that. Hey, I wasn't offended! Also, I wasn't just responding to your comments, but to everyone who posted regarding the Spidey Child Abused Prevention comic. As I said, I have no problem if someone found it campy, poorly written (and I know you didn't say it was), or a strange combination of Reefer Madness and Ed Wood. I was just attempting to clarify what the comic was actually trying to do and why. So, no need to apologize! I also see your point regarding people being surprised by young Peter Parker having been sexually abused. 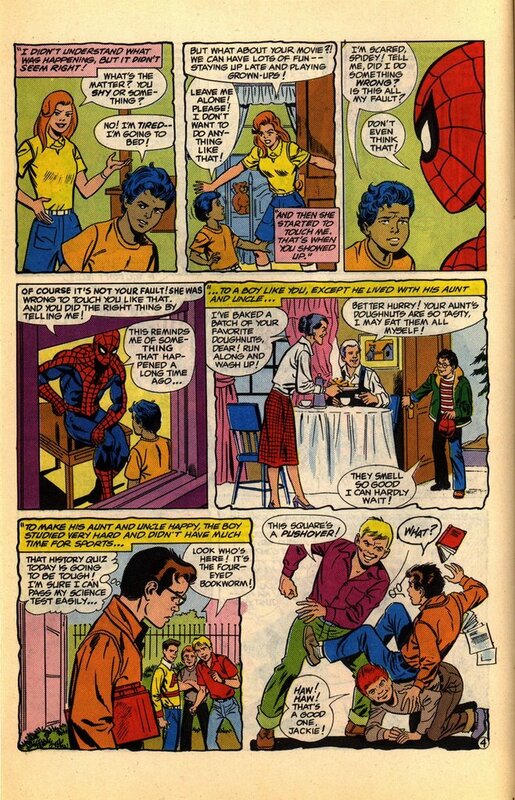 In my original script, Peter actually wasn't abused, and had gotten away, just like the kid he's telling the story to also escaped his would-be abuser. The decision to actually have Peter abused came after the story was drawn, and had to be added in, which may explain why it comes off so abruptly. Knowing after the fact exactly what was wanted, despite prior approval of a complete plot outline, I would've handled the story differently. That said, I do believe the decision to have had Peter actually abused was the right one. It sends a very powerful message to victims of sexual abuse -- that it wasn't their fault, and that it could happen to anyone -- and that was very important. As for people being shocked... well, if they're shocked that Marvel had the courage to present their top character in such a way, then perhaps they missed the point of what Stan Lee's original vision of the character really was -- a very real, flawed, human character, who winds up with superpowers. This certainly fits in with that vision. On the other hand, if they're shocked that they can't envision the Marvel of today doing such a story, then they haven't been reading the comics lately. In the past year, it's been revealed Gwen Stacy had an affair with Norman Osborn, Peter's had an eye plucked out by a villain, become an Avenger, and he's revealed his secret identity to the world. Or, if people are shocked that something like this could happen to a character they care about and it saddens them as if it had happened to a real person, then I understand. Worse, however, is if somehow this is perceived as shocking because it lessens the heroic character of Peter Parker in any way. That would sadden me if anyone felt that way. Also, I see no need for you to change anything you wrote, and I don't doubt that there are far harsher comments regarding the story out there. Again, I really don't mind that at all. You see, I like your blog, and I was just trying to add another perspective. Oh, and there's certainly no need to restrain yourself from goofing on any Spider-Man stories I ever worked on. While I certainly always tried my best, I'm also very aware of when things just didn't work out like we had hoped -- which happened quite often. Given the nature of how comics are produced, I'd be hard-pressed to find anything I've ever worked on that couldn't be greatly improved. So, say whatever you want! I think I can take it! I just happened to check this blog after having been away awhile, and I noticed that you had turned up. How've you been? Where've you been? If you want to take this dialog offline, e-mail me at jmassara@comcast.net. Thanks for posting these pages; I never knew they existed -though for a different reason. 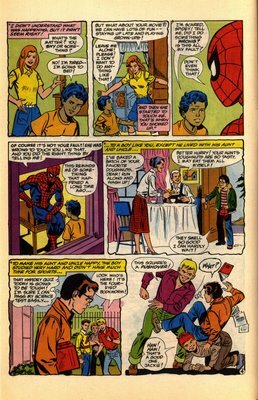 I remember the STORY, but the way I remember hearing it was told in the daily Spider-Man comic strip that ran in my local newspaper. I recall that it had completely different artwork and different dialogue. Is it possible that two different versions of this story exist?